Sub: . Reported cadre merger idea on Indian Railways-reg. While enclosing copy of Press Clipping of Indian Express (New Delhi Edition dated 02nd June, 2018), on merger idea of Hon'ble Railway Minister, NFIR brings to your kind notice that the Railwaymen's Federations are contributing for Railways efficiency while inculcating greater sense of devotion and dedication among all sections of Rail Workforce. Although it has been acknowledged that the Employees' Federations are stakeholders of Indian Railways as announced on the floor of the Parliament by the Hon'ble Railway Ministers, it is surprising to note that the policy decisions are being taken behind our back. During the meetings with the Hon'ble Railway Minister on 9th February, 2018 and 04th April, 2018, NFIR has appealed that prior consultations are very much needed on vital proposals of the Railway Ministry to facilitate collective decisions which may consolidate the present healthy industrial relations. The Hon'ble MR has positively responded and conveyed to Member Staff to hold consultations on important issues and proposals. Unfortunately, the Railway Ministry has been resorting to arbitrary decisions without realizing that such decisions would have serious implications and ramifications as the career of various sections of employees is involved. As an example, NFIR cites the Railway Board's letter 2018/|O&M/8/l dated 01/0512018 on Cadre Control/Manpower Management of Mechanical and EMU/MEMU/TLIAC Maintenance and Operation. On this subject, NFIR has sent communication to CRB vide letter No. IV80(i)/Part II dated 16/05/2018, expressing Federation's serious objection, while conveying the negative impact on working and requesting to withdraw the order to facilitate consultations at the highest level of the Railway Board. A copy of the said letter is again enclosed for kind perusal. 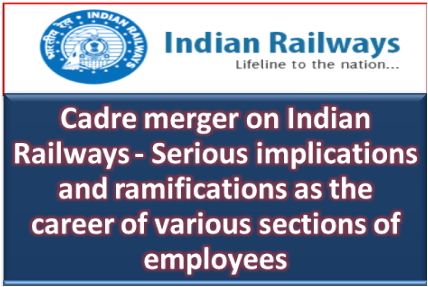 On the cadre merger idea, appeared in National News Papers on 2nd June, 2018 (Indian Express, New Delhi Edition), NFIR conveys that such experiments if made, would disrupt seriously the well built Railways working leading to crisis situation and once Railways got broken on account of illogical/irrational decisions without proper study and without taking into confidence its stake holders/Federations, it would be very difficult to repair and restore. You may kindly appreciate that the only major network in the country which provides services to the vast vast population, mainly to the poor, is "Indian Railways". NFIR trusts that you appreciate the difficult role being played by, all sections of employees right from highest to the lowest level for providing uninterrupted flow of traffic, maintaining safety standards by and large. Such gigantic and complex system, Indian Railways needs to be augmented and further consolidated for meeting the future demands of the nation instead making experiments. The news appeared in the News Papers (Indian Express - 2nd June, 2018) is very disturbing and causing serious concern among all categories of employees including officers as everyone perceives that the 'move' if true, is totally unjustified. NFIR, therefore, requests your kind intervention for saving the Indian Railways. NFIR also requests that a special meeting may be convened at your level with the Federations for free and frank discussions as the Federation's intentions are aimed at improving Railways' efficiency levels, therefore this communication is being sent.